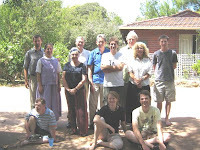 We farewelled Jeremiah and Eirene Coburn from the Bruderhof yesterday. They are returning to New York after spending six weeks in Perth. Thanks to Marcia for this photo. Tim brought an exciting proposal for PAF to hold an art day. I’m hoping he’ll keep the blog posted with developments. But just in case, this is the announcement, that it’s going to be happening. Hopefully it will be including many facets of art, including: drawing, music, and poetry. Free house church book – "Houses that change the world"
Unfortunately, it’s a rough draft and full of mistakes, but it inspires me enough to want to buy the finished product! I will need to spend some time unpacking his ideas, and how they challenge what I and PAF are doing. Sunday 18th February 2007 – Does God still speak from pillars of cloud? There were twelve of us meeting together yesterday morning. The readings focused around the transfiguration of Jesus, and Moses’ veiled face as he came down from the mountain. In answer to this, I told how I am being challenged to start seeing God at work in the world. My instinct is to find God in the Bible, in books, in theology, in conversations, in ideas. But I am reading Wolfgang Simson’s work during the last fortnight and am completely challenged by the way he looks to things going on right now, to prophetic words being spoken by people and finds God at work in them. Simson says at one point “God is offending our minds in order to reveal our hearts.” I guess I’m in need offence. Simson pushes far further than I am comfortable, even finding God’s judgement in natural disasters, whereas my response is to always go back to what Jesus says some place in Luke, when he asks if the people who were killed by a falling tower were any worse than anyone else. The practical effect so far? – I was walking home from the bus the other day and realised with joy that God was in charge of the wind, was involved in the grass growing and the roses in the park near my house. – I’ve been praying more, and praying for little things I didn’t use to bother God with. After I told this, Brad shared that he is being challenged in a similar way, that he’s stopped seeing coincidences as God’s work – but he wants to recover a sense of God at work. Church discipline is a dirty word in churches today. It makes us think of cults or fundamentalists. If it’s practiced at all, it’s applied to sexual sin or doctrinal error but not greed or gossip. The person doing the disciplining is usually the minister or the elder. Even churches that emphasise the priesthood of all believers don’t include disciplining as one of the roles of all believers. What attitudes do we see toward discernment? Individuals’ issues are left entirely up to the individual’s conscience. Church business and spiritual matters are largely decided by the leaders, perhaps with ratification from an annual meeting of the members. Tonight I’m going to put forward the idea that discipline and discernment are two key parts of the church’s life. When we practice them as Jesus intended, we get closer to being the type of people he wanted us to be. The Anabaptists of the sixteenth century saw these two parts of church life as essential to their vision of Christianity, as important as pacifism. The main part of my talk focuses on looking at what Jesus had to say about discipline and discernment in Matthew 18:15-20.
two of you are alone. If the member listens to you, you have regained that one. Matthew 18:15-20 has two logical parts to it. In verses 15-17, Jesus tells us the procedure to follow when our brother or sister in the church sins. The first Anabaptists called the procedure in Matthew 18:15-17 the Rule of Christ. In verses 18-20, Jesus broadens this authority to discipline to include the idea of the authority to decide what’s right and wrong – discernment. Discipline presupposes that we have already been discerning things together as a church. And then in order for discernment to be carried through and acted on, it requires us to disciple each other. So the two parts may seem disconnected at first, but the connections will become clearer. What sins need to be confronted? It makes a difference. Do you we only have responsibility to talk to our brothers and sisters when we are the victims? Or do we also have a responsibility to help them whenever we see them doing something wrong? I suggest that the earliest manuscripts are probably correct and that ‘against you’ does not belong in Matthew 15:15. If we have to confront even sins that aren’t against us, what sins does that include? Anything that is taking the brother or sister away from God. Anything the community has agreed to hold each accountable for. The first step, of going directly to your brother or sister, avoids shame and gossip. It goes against our culture. We don’t like to confront things. We don’t like to be honest. We would much rather complain about a person behind their back than face to face. Other people are more likely to agree with us about the person! Don’t go while you’re angry; don’t go to vent your rage. But don’t wait too long before you say something. It will only get harder. The second half of verse 15 tells us the goal of the Rule of Christ – ‘If the member listens to you, you have regained that one.’ The goal is not punishment but restoration. Many of the abuses and misuses of church discipline come about when church discipline is used to punish rather than restore, or when it jumps straight to excommunication in the name of keeping the church ‘clean.’ When our goal is reconciliation, we are going to be more gentle and more humble. We get a great picture of regaining our brother when we remember the parable Jesus told earlier in the same chapter – the shepherd going all out to get back the sheep who strayed from the flock. Sometimes you can’t work it out between you. You can’t agree on whether the person is actually in sin. This might be because the church hasn’t discerned the issue enough – the binding and loosing hasn’t made clear what should be done – we’re going to cover that later. It might be that you need another perspective – and that is why, in the second step, we bring in one or two others – someone with more spiritual wisdom or experience, someone who can listen carefully to both sides. If the conflict still can’t be resolved with the help of one or two others, the matter is made public before the church. But what sort of church does Jesus have in mind? I have to say, it’s not the type of church we commonly see. Paul’s concern is the offender’s reconciliation, that he might realise the seriousness of what he has done and repent. So, even at the fourth stage, the purpose is still to win the brother or sister over. If the offender refuses to listen to even the church, we are to treat him or her as a tax collector or a pagan. The traditional ideas of excommunication don’t stack up to this direction. How did Jesus treat tax collectors and pagans? He ate at the table of tax collectors! He treated them as people in need of good news, in need of conversion. The church is recognising what has already happened – the offender has broken with the fellowship and is no longer a member. Jesus doesn’t explicitly mention restoration as a separate step, but he says it’s the goal of the process. Sometimes restoration won’t happen. But it is your hope and prayer that it will. Restoration should be as public as the discipline process was. It needs to come about as a result of obvious repentance. The church should then forgive the person and welcome them back into the church. Marlin Jeschke writes about the church that used the parable of the prodigal son as their model. When a man who left a congregation returned in genunine penitence five years later, they literally gave him a new sports coat, had a gold ring made for his finger and had a feast of veal with him. Restoration should be full and final, with the person welcomed back into full church membership. ‘Bind’ and ‘loose’ were two words with special meaning for the Jews. They were used to describe the process of trying to work out how the Law applied to a particular situation. If a rabbi decided a law did apply to a particular situation, he was ‘binding’ it. Jews were obligated to apply it. If he decided it did not apply to a particular situation, he was ‘loosing’ this law. Jews were ‘loosed’ from the obligation to apply it. To use Matthew’s terminology, the decision was that the law (“Do not steal”) was bound when the bird was found in proximity to its likely owner; one who keeps the bird under such conditions has transgressed the law and is guilty of sin. But the law is loosed when the bird is found at a distance from any likely owner; the law against stealing does not forbid keeping the bird in that instance. Throughout Matthew’s gospel, we have examples of Jesus binding and loosing. I’ve taken these examples from Powell’s article. Jesus is binding the law prohibiting murder as applicable to anger and insults as well. 5:27-28: ‘You have heard that it was said, “Do not commit adultery.” But I tell you that anyone who looks at a woman lustfully has already committed adultery with her in his heart.’ Jesus is binding the law prohibiting adultery as applicable to lustful thoughts as well. 5:31-32: ‘It has been said, “Anyone who divorces his wife must give her a certificate of divorce.” But I tell you that anyone who divorces his wife, except for marital unfaithfulness, causes her to become an adulteress, and anyone who marries the divorced woman commits adultery.” Jesus binds the prohibition against adultery as applicable to divorce and remarriage, and does so by saying that the Scripture that allows for divorce was a concession granted in recognition of ‘hardnesss of hearts’ and that it never expressed the actual intent of God – quite an incredible thing to say about the Scriptures. But Jesus also looses his own prohibition of divorce for those instances involving infidelity, both here and in 19:9. In 5:43-48, Jesus binds the commandment to ‘love your neighbour’ as applicable also to loving your enemies. In 12:1-8, Jesus looses the ban on working on the sabbath to get food when you’re hungry. He says that the way Pharisees bind the law in the same situation ‘condemns the innocent’. In 15:3-9, Jesus binds the command to “Honour your father and mother” as applicable to caring for your parents in old age. We are given authority by Jesus to carry on this process in the church, to work out what the Scriptures call us to do in particular situation. Some of the questions we decide by binding and loosing will be personal ones; other questions will be practical and moral questions for the church. and place, have both the clear meaning and the absolute authority of revelation. The complicated ways we define the Bible objectively begin to lose their importance as we try to apply it, as we work out whether it applies to a particular situation or not. What is the link to the first part of the passage, the Rule of Christ? If the offender refuses to listen to them, tell it to the decision-making-gathering, so you can decide he is no longer part of the gathering. Whatever decisions your gathering makes, they reflect God’s will. 2. For Jews, ‘Bind and loose’ also suggested the power of letting someone be a part of the community or not – often in response to whether they obeyed the decisions of the rabbis. In Matthew 16:9, Jesus gives Peter the keys to the kingdom and tells him that whatever he binds on earth will be bound in heaven – a clear reference to the authority to decide who’s in or out of the church. Like the rest of the world, churches don’t usually follow Jesus’ command in Matthew 18. What are the immediate applications? How can we go home from this conference and start to put it into practice? 1. Going directly to our brother or sister when we’re offended. It sounds like a small thing, but it would actually make a huge difference to the life of churches. Too often, instead of telling the person who has offended us, we tell someone else and get this third person on our side. Gossip and bitterness replace honesty and love. In fact, the failure to follow Matthew 18 holds churches back from developing true Christian community. In going directly to our brother or sister, we prevent conflict from escalating. We develop honesty between each other, and we begin to truly understand each other. For example, I might be getting angrier and angrier that each week a newcomer to our church argues passionately against theological points other people make during discussion. My first impulse is to complain to others in the church who would agree with me that he is argumentative and difficult. But instead, I decide to talk to him about it, just between the two of us. He tells me that he had no idea that was the way he came across; the only way he is used to talking about theology is in a debating style like he was taught when he studied at university. I tell him that our Sunday meetings are more aimed at encouraging each other to follow Jesus than at debating theology for its own sake. He says that in future he will be less argumentative and more focused on encouraging. I come away with a better understanding of why he is the way he is; he understands our church’s expectations better. I think the biggest challenge is trying to make room for it in your church context. It requires other members of the body to give time, thought and prayer. So for a start, you have to convince the others in your body that it matters, that you need their input for your decisions. The handout suggests some study materials you could use to introduce people to the themes. In a house church, the appropriate time for discernment is often in the sharing time of the worship meeting. But it’s hard even in a house church to make sure it gets the priority it should. It sometimes means throwing out your plans for a particular meeting and giving someone the time they need for discernment. It’s a challenge I would make to my own house church, Perth Anabaptist Fellowship, that we have to be more ready to move with the Spirit and spend time on a particular person’s problem or on binding and loosing an issue that comes up. It’s even harder in a conventional church. Let’s be realistic and admit that a typical Sunday worship service is set up all wrong for it. If you’re going to stay in a conventional church, then the midweek small group is one place for discernment. But you might have to change the structure and assumptions of the small group. Are you there just to study the Bible in a smaller group, or is the group going to take on the full body life? Are you going to make time to get involved in each other’s lives and discern important issues? Another options – you might call together a group of people from your church after a Sunday meeting and ask them to talk and pray with you about something. 3. Discerning Christian ethics as a church. We have to work out together as a church in what ways Jesus’ life and words and the example of the early church are ‘binding’ on a particular situation. We work out what following Jesus means so that we can then help each other when we sin by not living up it. I’m divorced and I want to remarry; are Jesus’ words in Matthew 5 binding? Confession is a practice which pre-empts the Rule of Christ. Rather than waiting to find your brother or sister in sin, you seek each other out and confess whatever is on your mind. One benefit of this is that it encourages a relationship of honesty. If your brother ever does need to confront you, you will be more open to it, because you’re constantly talking about sin and forgiveness. Find a discipleship partner. If you are committed to meeting every week or two to confess sins to each other, it’s much easier. You don’t have to seek someone out each time you find yourself committing a ‘big’ sin. 1. Baptism into a new humanity: brings the believer into the world where binding and loosing happens. Reconciling to each other through the Rule of Christ can be thought of as the glue which holds together the different people. Also, part of the baptismal commitment should be declaring that you are open to correction and committed to restoring your brother or sister who is caught in sin. 2. The fullness of Christ, which John Olley will be talking about on Saturday, is about the way every believer is gifted, every member of the body has a part to play. Like the fullness of Christ, binding and loosing recognises that every believer is a priest. Restoring the priesthood of all believers means practising the fullness of Christ and binding and loosing. 3. Happens before the Lord’s Supper. On Sunday Ian Packer will be talking about how the Lord’s Supper was an actual shared meal with economic and social meaning. The practice of the Anabaptists in the 16th century was to not eat together until they were right with each other, based on Jesus’ injunction in Matthew 5:23-24 to be reconciled to your brother or sister before offering anything at an altar. 4. The Rule of Paul – we don’t have a session on the Rule of Paul, but it overlaps a lot with the fullness of Christ and with binding and loosing. Yoder takes the title “The Rule of Paul” from 1 Cor 14. Paul tells the Corinthians that if anyone in the congregation gets a word from God, everyone else is to be quiet and listen. So the Rule of Paul is an open meeting where the church recognises that God could speak through any of the people in the gathering. It is the basis on which you can have a meeting for discerning and discipline.